Hospital Leagues and their badges - A short article. 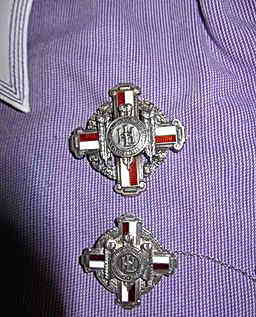 Hospital Leagues and their badges. The first League of Nursing was opened at St Bartholomew's Hospital London in 1899, with the league badge following in 1900. 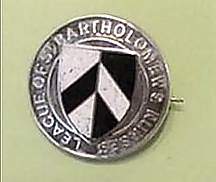 This badge has been the basis for many of the badges which followed on afterwards which were issued to nurses qualifying at St Bartholomew's (Barts). Leagues were formed to promote nursing/provide support after qualification with a few as early as Barts. They are often open to nurses who not only trained at a specific hospital but who also work or who have worked there, so for instance, some tutors from the Princess Alexandra School of Nursing at the London are members, although they trained elsewhere (as in the case of Miss Edith Parker (who sadly died in 2012), an inspirational Principal of the school of nursing when the author was a student there). The league meetings give a chance to meet old friends, even ward sisters who once terrified us, tutors, make new friends, catch up on life events and share professional issues. For those of us who no longer nurse, the nurse is always in us and the interest in all things nursing is still there. The Royal London Hospital (R.LH.L.N.) has two meetings per year - the October meeting has two lectures, (which can act towards professional updating for nurses who are still working) - certificates are awarded. This year's lectures were "Hughes Syndrome" by Professor Hughes, and "The Bucket List" by an end-of-life coordinator in Brighton. The other meeting acts part as an Annual General Meeting, with also time for a short lecture and church service for those who wish to attend, and a chance for others to enjoy the local area - often visiting old haunts/seeing new developments such as the view from the new hospital canteen! Before every meeting there is a chance to purchase a lunch ticket, provided by the league, which gives a good chance to catch up with friends and also time before and after each day. At present the London Hospital Badge , first designed in 1929 as the league badge(1) is still the badge worn by league members.. It is not apparent what other new members will wear when attending meetings- many members still wear their badge with pride to meetings, although some trepidation should they be lost. It is generally rumoured that many leagues of nursing within London are closing down. · Amalgamations and closures within London hospitals (the amalgamation of UCH and the Middlesex, also Charing Cross and Westminster, Bart's and The London, Guys and St Thomas's). · Nurse training (and the as nurse training changes loyalties and attitudes to individual hospitals). A short survey of hospital league's within London on the internet also bears this out. · Westminster, the Middlesex, Hammersmith, St Mary's Paddington, Prince of Wales Hospital, and Guys leagues of Nursing are now all closed- some as recently as 2010. · St Bartholemew's (Barts) - founded in 1899. · The Royal Free, founded in 1910 (with the same badge being worn until 1975, when the words 'Royal Free Nurses League' were replaced by 'Royal Free School of Nursing', and the badge presented to all trainees of the School. · Kings College Hospital, founded in 1924. · St Thomas' league, known as "The Nightingales Fellowship" , founded 1928,wear the iconic badge designed in 1925. · The Royal London, founded in 1931. · Great Ormond Street Hospital for Children - founded in 1937 - with an active league and web site. They have a league badge which says "The Hospital for Sick Children" around the top and "Nurses League" around the bottom - (no picture yet on web site). · St Georges, founded in 1952, closed in the mid 1980's but was reopened in 1990 in response to poor moral after the old Hyde Park corner St Georges moved to Tooting. · Central Throat and Ear Hospital, Grays Inn Road. In 1931several Presidents of Nurses League are mentioned at meeting of the National Council of Nurses, held in the offices of the Registered Nurses association in Portland Place, London. I understood that the RCN encourages/supports leagues, in so much that Presidents were invited to meetings , but can find no information to corroborate this. Perhaps all members and readers of schools of nursing could establish if their training hospital ( or current hospital/place of work )leagues still exist and function, what year they were founded in and if a specific badge (with picture!) is worn? 1. Copyright - Sarah Rogers 2013.